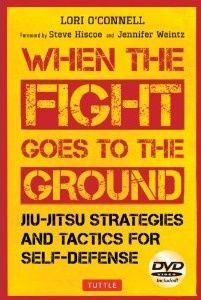 Lori O'Connell is the author of When the Fight Goes to the Ground: Jiu-jitsu Strategies & Tactics for Self-Defense, published internationally by Tuttle Publishing. She has been writing on her martial arts blog, Jiu-jitsu Sensei, since 2006, and has guest written a number of articles on other martial arts sites, blogs, and newsletters. She wrote and produced the short film 'Inner Demon', which was an official selection in Film Fu Fight Fest 2017. In addition, she won 1st prize for Roadkill, a piece she wrote for the E-Clips flash fiction contest in 2005. In addition to her writing, Lori graduated with honours earning a BA in Communication at the University of Ottawa, and worked professionally in marketing/PR as a copywriter and Web marketing/social media specialist for over 7 years both as a consultant and on staff for local Vancouver businesses. See Lori's author profile on Amazon.com. When the Fight Goes to the Ground: Jiu-jitsu Strategies and Tactics for Self-Defense. Published by Tuttle Publishing, 2013. Weapons of Opportunity: One Woman's Casual Crusade through the World of Dojos and Low Blows. Self-published, 2007. Excerpt read on The Storytelling Show (Vancouver Co-op Radio) during an interview on Feb. 25, 2013. Road Kill (1st Prize Flash Fiction Contest Winner). E-Clips Online Magazine, November 2005. My Love-Hate Relationship with the Triangle Choke. Published in the Canadian Jiu-jitsu Council Newsletter, Spring 2013. How to Grapple with Someone Bigger and Stronger than You. Published in the Jitsu Canada Newsletter, May 2013. Answering the Gender Question Behind Wing Chun. Published on WingChunLife.com, January 2013. Lori O'Connell's Personal Martial Arts Blog.